The Labor Day Weekend is over, but Kansas continues to party with the 2018 Kansas State Fair, starting this Friday, September 7 and ending September 16. The fair, which has been running for the last 105 years, takes place in Hutchinson, Kansas and traditionally brings in about 350,000 attendees from all parts of Kansas. The fair consists of over 1000 commercial vendors, competitions, educational exhibits, and a series of concerts sponsored by Nex-Tech Wireless. Supporting acts for the concert series include: Josh Abbott Band, Bret Michaels, Dan + Shay, Cassadee Pope, For KING and COUNTRY, and Trace Adkins. For a full list of acts and more information on dates and how to buy tickets, click here. In addition to the traditional events at the State Fair, the Kansas State fair has some new attractions making their debut. You can expect to be taken on the brand new ‘Moo U” barn tours, experience a ‘laser light show,’ and walk through a ‘butterfly house.’ For more information on these new amenities, check out this press release! The Kansas State Fair’s tagline for this year is ‘Find Your Fun’ and we have to agree that this is a fitting tagline. 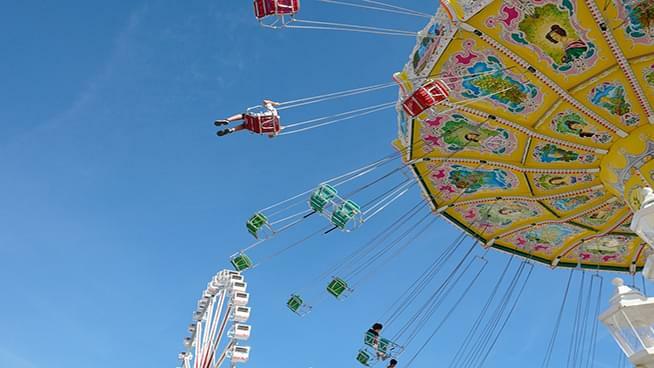 There is so much to do this year at the Fair that it might seem a little daunting at first. Don’t worry, the Kansas State Fair’s website has a downloadable daily schedule to help you navigate the exciting 2018 Kansas State Fair! With all sorts of amenities for your entire family to enjoy, you won’t want to miss the fair this year!